Through our love and passion for food and sharing, we have created Fernandez & Leluu – a home restaurant with a small but growing following. It is self-made, self-taught, self-backed, self-inspired, self this, self that and self other. We are sold out for 8 weeks and feed 50 people a week and now we earn a little from it to travel, to learn about food and to maintain good quality ingredients for our menus and hopefully venture further. It seems like what we are doing is very ‘purple cow’ and that our opinions really count even if it comes to chain restaurants or any restaurants for that matter that have millions backed into it and would need at least 50 covers a lunch time. Has the time changed to make the big fat cat turn to the stray puppy – even if it is dressing up as a purple cow? Upon arrival, the other three word-of-mouth-ers and I were offered some delicious Bellinis – (with peach puree) they were very very good! Jamie claims that they only use fresh produce in their cocktails and try to keep everything seasonal – I heard you would not find a strawberry daiquiri there in January. Not his first venture, he opened Shumi – a Japanese/ Italian fusion, with Roger Moore’s son, Jamie has opened Kitchen Italia in Earlham Street, Covent Garden (next to the great Donmar Theatre in what used to be the Bunker Bar). No doubt encouraged by the success of his first branch in Westfield Shopping Centre. With its big sharing wooden benches and promotional deals as paper placemats it looks like a Japanese noodle bar, bento eat such as Satsuma. I think it’s the perfect place to have a bite of lunch/ dinner while shopping – with their menus based on pasta –didn’t pasta originate from China’s noodles? For a quick bowl of pasta ranging from £6.95 to £9.95 – it’s surely in tune with today’s economic climate - aiming to be good value-for-money. “Fine dining is dead,” Jamie claims, “even if you can afford it, it is seen as ‘vulgar’ these days.” And who knows better than Jamie, who honestly and interestingly went on to tell us about the failures of Shumi – how having A-List celebrities on your opening night does nothing to provide any good word-of-mouth, in fact just “pissed off the food critics”. Going back to basics and serving “street food” and not complicating menus seems to be the lessons he learned. We commenced with the pasta making course (PR exercise) where we met the lovely Head Chef, Lee Burcell, (Jamie found Lee by going around testing pomodoro sauces). 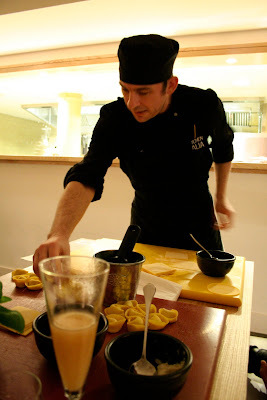 Lee is from Yorkshire and has traveled throughout Italy, learning chef techniques and the secrets about Italian food. Jamie managed to drop quite a few famous celebrities Lee has cooked for. 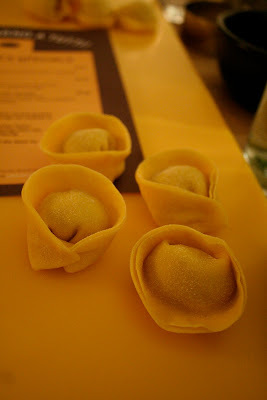 Lee said that I was very good at folding my Cappelletti (con Anatra), it made me blush! He seems very passionate and proud about his love for Italian food, telling us that from the age of 5, Italian boys are cooking with their grandmothers – being tested on making the perfect tomato sauce. (such a good idea – I will do that). But I didn’t ask him how long he has been mastering his sauces. The spicy tomato dip that comes with the doughy house-made hot crispy bread sticks were incredible. I would go there just to moor those like a savage. Kitchen Italia is simple and unpretentious and Jamie clearly wants the place to be about the love of great Italian food he has eaten on is jaunts. I had been back with a friend and we stayed for hours on a Saturday night catching up and chatting, drinking wine from a lovely carafe (very authentic). We shared a table with a couple who said hello to us – which was really nice and unusual. I think the social ideas of supper clubs are catching on. Our waitress was very charming although it was a bit like she was trying to ask us if we wanted fries with everything (but different breads instead, although we ordered their amazing bread sticks). 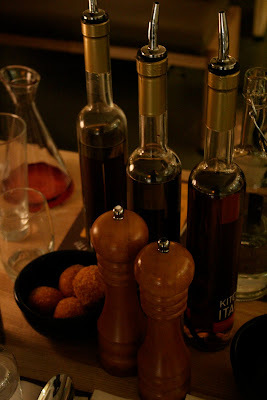 I love the way they have different olive oils on the table, and a pot of basil, parmesan and salt & pepper – again very oriental. It just means you can participate to seasoning your own dish. It’s a far cry from a typical Italian restaurant but it’s not meant to be one. Jamie has moved that era forward a bit- “it’s a Strada but like Wagamama but a much warmer feel,” my friend, Anja says, “I like it, the pasta is not amazing but I have only found a couple of places in my life that does pasta – amazing, the way I love it. I think it’s the hardest thing to do – making something simple like a Penne Arrabiata.” As Lee rightfully said, the Italians are doing it since the age of 5. I couldn’t help but wonder why it is not perfect. 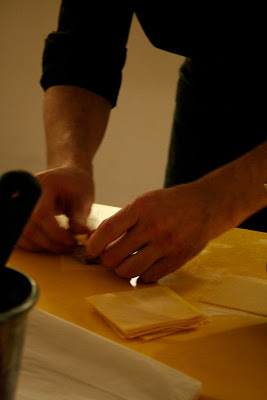 I’d imagine, Lee would cook me the most wonderful Vongole if I were lucky enough. What happens to the kitchen when the head chef is not making my pasta dish, the owner is afar mulling over his accounts. I assume there are set standards for how their pasta sauces are meant to be but will it ever be the best sauces if its not made by the person who created the recipe? Is it because these chain of restaurants cater for people who eat pasta for lunch when out shopping at Primark or for those who love real Italian food? Jamie says that in Westfield, most plates get sent back because its al dente; the black truffle pasta sent back because it was black; the tiger prawns sauce because its too spicy. As a business, would you be forced into middle-of-the-road blandness just to please the masses? “Or is being safe too risky?” (Seth Goldin). I don’t mind a bit of Strada or Kitchen Italia every now and again – definitely good value for money for those pre pay-days. Will be back for the bread sticks, tiramisu and hopefully, Vongole from Lee.